I’ve been using Mind Lab Pro™ for the last two years. This is my review of why I use it. And why you may want to consider trying it too. 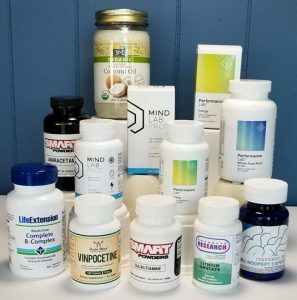 I often get emails from Nootropics Expert readers asking me what my favorite nootropic stack is. And what I use every day. This post is a detailed response to that question. NOTE: This review has been updated to reflect the changes to the Mind Lab Pro formula which was refreshed in early 2017. Mind Lab Pro™ is by far the best nootropic stack I’ve ever used. And I’ve tried a lot of them over the last 10 years. Including ready-made stacks from the local vitamin shop to many of the well-known stacks found online. Nearly 10 years ago, I was diagnosed with Adult ADD and my doctor put me on Ritalin. It was like the lights suddenly came on in my brain. And for the first time in my life I could concentrate and focus. Up to then, I took my brain for granted. And hadn’t considered that the health of my brain affected every single aspect of my life. That point was also the beginning of a journey into how my brain worked. What was wrong, and an earnest search on how to fix it. I’ve read thousands of threads on Reddit, Longecity and nootropic blogs in this search for the ultimate nootropic stack. Who Makes Mind Lab Pro? As this deep dive into neuroscience took shape, I started to develop a map of sorts on what my options were. Areas that I could fix on my own. And other areas that could be boosted and tweaked to get the most out of this amazingly complex organ in my head. It soon became clear that no prescription drug on earth could help achieve the results I was looking for. A completely optimized brain firing on all cylinders. So I turned to natural supplements and started experimenting. Through trial and error things started to come together. My memory and recall got better. Confidence levels improved and I was in a better mood. Stress levels went down. And a better night’s sleep was finally within reach. 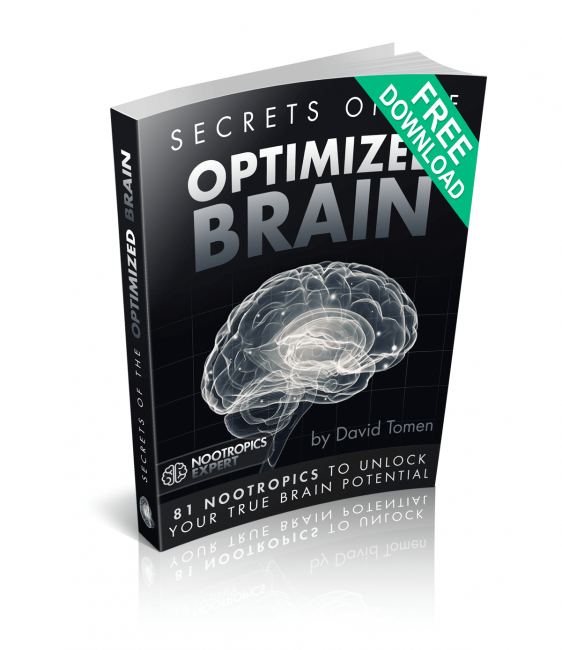 Anyone who has been down this path of brain optimization knows the expense and work involved. I’ve spent thousands upon thousands of dollars on supplements. Trial and error with different compounds. 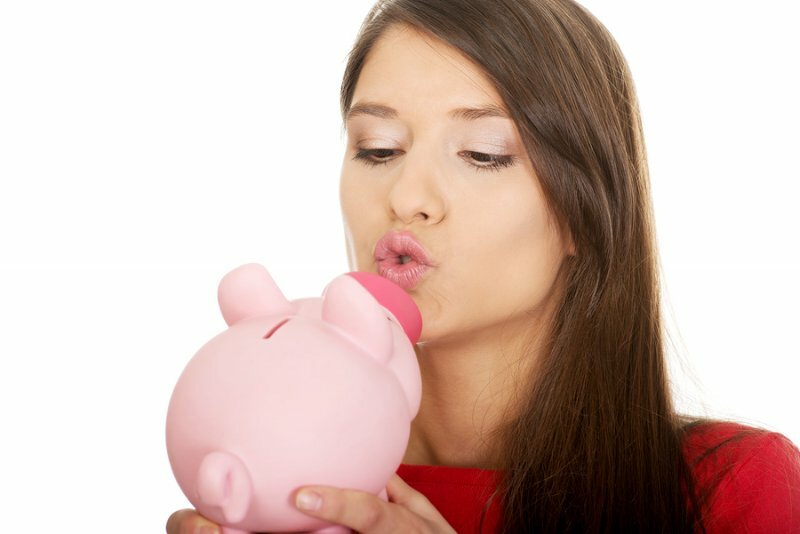 Buying ready-made stacks that promised a lot. But always fell short in some way. Eventually I started buying nootropic supplements in bulk powder form and began making my own capsules. Still a costly way to boost my brain power but entirely worth the effort and expense. Both in my career and relationships with those I love. But I was always on the lookout for the ideal nootropic stack that could help replace some of the many supplements I was taking. And in late 2015 I finally found it in Mind Lab Pro. I’ve been using Mind Lab Pro every day since then. And haven’t found another premade nootropic stack that comes anywhere close to what this stack can do. 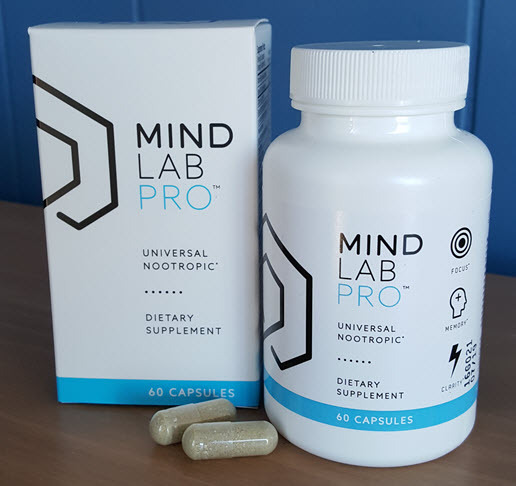 Mind Lab Pro is a premium nootropic stack developed by the Mind Lab™ at Opti Nutra in the U.K. The company promotes Mind Lab Pro as “the first Universal Nootropic” stack that boosts all aspects of cognition in all types of people. This nootropic stack can be used by students, athletes, competitors in sports and games, working professionals and even those over 55. So how can one stack promise so much in just two capsules per day? Let’s dig into the ingredients to see what they do in the brain, and how they work. (Note that every ingredient in Mind Lab Pro listed here links through to a full review of each nootropic on Nootropics Expert. You’ll get more detail on the history, clinical studies, dosage recommendations, side effects and forms available). This is the formula that the team at Opti Nutra Ltd. created for Mind Lab Pro that works so well for me. And thousands of other neurohackers around the world. The active bacosides in Bacopa protects brain cells from free radicals which prevents cell damage and death. Bacopa also boosts acetylcholine, GABA and serotonin – all tied to focus, clear memory and better mood. Bacopa even helps boost cerebral circulation. Citicoline helps synthesize phosphatidylcholine (PC), a major phospholipid found in brain cell membranes. And supports the neurotransmitter acetylcholine while providing antioxidant activity. Phosphatidylserine (PS) as Sharp PS® Green 100 mg improves memory and attention, increases cognitive processing speed, and accuracy. [iii]PS is a phospholipid making up 15% of brain cell membranes. Maintaining cellular fluidity, optimizing neuroreceptors and promoting acetylcholine and dopamine. PS even increases nerve growth factor to help neurogenesis, cell maintenance and repair. Lion’s Mane Mushroom (full-spectrum) 500 mg is effective in improving memory, neuron repair,[iv] liver detox, and regulating blood sugar and cholesterol levels. Lion’s Mane is the only mushroom that supports brain health. The active hericenones and erinacines stimulates Nerve Growth Factor which helps neurogenesis, and myelin axon sheath synthesis. Improving neuroplasticity which is involved in memory formation, and keeping cell membranes healthy. Rhodiola boosts mood by influencing norepinephrine, serotonin and the feel-good opioids like beta-endorphins levels in your brain. It helps neurogenesis, activates the synthesis of ATP, and reduces the inflammatory C-reactive protein in your brain. L-Theanine 100 mg as Suntheanine® improves focus[vi], sleep, immune system strength, and blood pressure control.L-Theanine increases alpha brain waves which are associated with relaxation and enhanced creativity. It settles excitatory neurotransmitters while promoting calming neurotransmitters like serotonin and GABA. Sharpening attention, alertness and focus that help creative problem solving, learning and studying. N-Acetyl L-Tyrosine (NALT) 175 mg is an amino acid critical for the synthesis of catecholamine neurotransmitters dopamine, epinephrine and norepinephrine in your brain.Boosting these catecholamines helps improve cognition, mood, and memory. NALT has been shown to promote working memory when multitasking. [vii] And NALT helps optimize mental performance under high stress, fatigue and sleep deprivation. Maritime Pine Bark Extract 75 mg standardized for a minimum of 95% proanthocyanidins. This extract helps increase levels of nitric oxide which helps dilate blood vessels. Delivering more oxygen and glucose to brain cells for more energy, better learning and memory, enhanced focus and elevated mood. Pine Bark Extract is one the most potent antioxidants ever discovered. Scavenging free radicals to protect neurons from oxidative damage. B6 also helps protect your brain from excess homocysteine that can damage blood vessel linings. And B6 helps form myelin which is the protective sheath that surrounds axons in your brain and body. Vitamin B9 100 mcg in the bio-identical form of OptiNutra’s BioGenesis™ vitamins. This vitamin participates in one-carbon transfers for the synthesis of DNA and RNA. And works with the other two B-Vitamins in this stack help regulate homocysteine levels. Folate is also involved in gene expression, amino acid synthesis, and myelin synthesis and repair. Vitamin B12 7.5 mcg in the bio-identical form of OptiNutra’s BioGenesis™ vitamins which is required to regulate homocysteine levels in your brain and body. One of the things that stands out in this nootropic stack is Opti Nutra chooses to use their proprietary BioGenesis™ form of vitamins. Which are nature-identical to ensure these B-Vitamins are completely absorbed and used by your body and brain. The amount of each ingredient listed is for Opti Nutra’s recommended 2-capsules per day. You can safely increase your dose to 4-capsules per day. 2 in the morning and 2 early afternoon. Like every nootropic, it’s always better to start low and see how your body and brain react before increasing your dosage. synergy or how they work together and complement each other for maximum results. This idea of “synergy” is a big deal when putting together a nootropic stack. While each nootropic on its own could call for a higher dosage, when combined they work together better in the brain at smaller doses. But more on these doses in a minute. One thing that irks me is the way many nootropic manufactures ‘hide’ the exact amount of each ingredient in their stack. They call it their “proprietary formula”. But Opti Nutra chooses to disclose exact amounts on their packaging. So I know exactly what I’m taking. For me, this shows respect for me as a customer. Then I have the option of upping doses of certain nootropics that are unique to my condition and state of health. For example, I’m Adult ADD and continue to use 20 mg of Ritalin twice a day. Ritalin works by blocking the reuptake and degradation of dopamine in my brain. Making more dopamine available to help my focus and concentration. The problem for me, and for many with ADD and ADHD as we get older is there’s not enough dopamine in my brain to start with. Mind Lab Pro addresses this lack of dopamine with NALT. But in my case, the dose of NALT is too low. So I add 800 mg of NALT and 1,000 mg of ALCAR each time I take my Ritalin dose. The result has been greater efficacy of Ritalin. I’ve never had to increase my dose of Ritalin due to tolerance. And at the end of my day, I don’t experience a stimulant ‘crash’ which is common when using these types of stimulants. Do I consider this a ‘con’ for Mind Lab Pro? Absolutely not. Because while I need extra dopamine and acetylcholine in my brain, you may not. Unless you’re dealing with something like ADHD. And I know exactly how much NALT and ALCAR to add to this stack because Opti Nutra tells me how much they are supplying in their stack. There is no guessing. I love this nootropic stack. Two capsules in the morning with a tablespoon of organic unrefined coconut oil. And it launches my day. In my case with ADD and being hypothyroid, I take another two capsules at noon with coconut oil. I also use 1,000 mg of DHA in the morning. Along with Aniracetam and Sulbutiamine. Since starting Mind Lab Pro my productivity has increased. My mood is better. Focusing on several projects is not a problem. Work seems to go faster. And I get more done in less time. Everything just seems better. And life flows. One of the things I’ve learned over the years of working with nootropics is it’s not cheap. In fact, taking each nootropic on its own in my case, can add up to a few hundred dollars per month. But using Mind Lab Pro has dramatically reduced my nootropic budget. Here’s a breakdown of how much each of these nootropics would cost if purchased individually. Note: These prices are from Amazon.com here in the USA at the time I write this. They’re usually competitive with other retailers online, and brick & mortar stores. 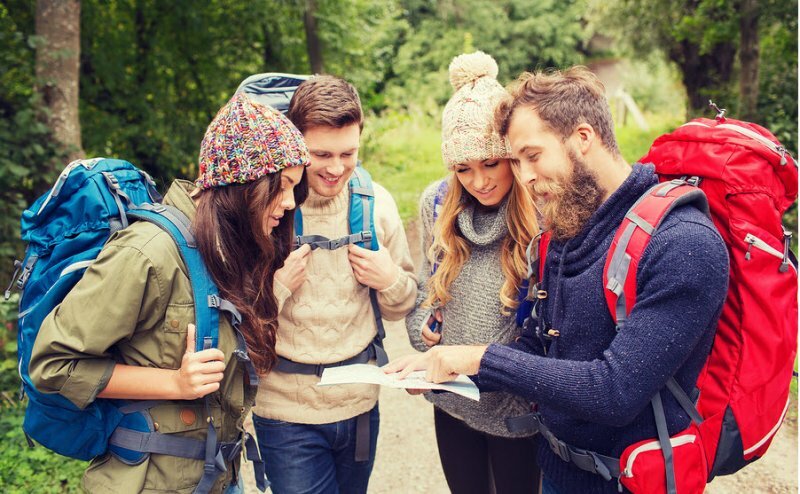 Prices could be different in your part of the world, or when you read this. The total of each of these evidence-backed nootropics when purchased individually comes out to $187.60. Now I realize that the dosages in this comparison are often higher when used individually. The quantities per bottle are often higher than a monthly supply. And I’ve included supplements packed in vegetarian capsules which are often priced a little higher than regular capsules. Sure, I could re-calculate each of the comparison prices by counting capsules per bottle to figure out the exact monthly dose. Adjusting the price per capsule accordingly. But my point here is the cost of buying each of these nootropics individually will be higher. Much higher than what Opti Nutra charges for Mind Lab Pro. 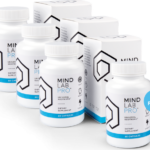 Mind Lab Pro for a 30-day supply if you take the recommended 2 capsules per day is only $65.00 (+ shipping & handling). 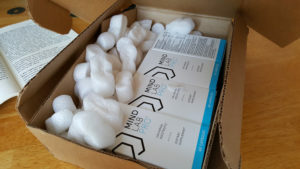 You can also choose a 3-month supply (3 boxes) of Mind Lab Pro for $195.00 and get one box free (including free international shipping & handling). That works out to $48.75 per box. Opti Nutra has taken an extra step to include Plantcaps® instead of regular vegetarian capsules in their stack. These vegan caps are made from tapioca. Most competitors (including the nootropics listed above) use HPMC vegetarian capsules which are made from a semi-synthetic polymer. Now, let’s look at what I think are the pros and cons of this premium nootropic stack. In all, I think the dosages included in Mind Lab Pro are perfect for this stack. In these dosage ranges side effects are minimized, or non-existent. And because they fully disclose how much is in each 2-capsule dose, I have a better idea on what I need to add to this stack for my unique issues. We recommend the use of Mind Lab Pro as a nootropic stack for total brain optimization. Pricing of Mind Lab Pro is very competitive for what you get. Some on reddit.com and other blogs have commented that Opti Nutra only sells this stack from their site. And don’t offer a free trial. I’ve been in internet marketing for many years and completely understand the hazards of offering a free trial. Especially when you’re selling a high-quality product at the best price you can to stay competitive. It doesn’t make sense to offer free trials when you back it up with a risk-free, “empty bottle”, money-back guarantee. Opti Nutra has also decided not to offer Mind Lab Pro on Amazon.com because they don’t want this stack to appear alongside low-quality junk products. I get that. Amazon can also be a place where reviews are easily manipulated by jealous competitors. And for anyone looking to understand the methodology that went into developing this stack, Amazon.com is not the place for extensive product descriptions. So if you’ve been experimenting with nootropics for a while, or even considering getting into neurohacking – I recommend giving Mind Lab Pro a try. This is the best pre-made nootropic stack I’ve ever tried. And this after nearly 10 years of trying dozens of nootropics. Both individual ingredients, and various stacks by different manufacturers. It’s certainly not the cheapest nootropic stack on the market. But it’s not unreasonably priced either at only $65 for a month supply. You can’t put this stack together individually for less than twice or even three times what Opti Nutra charges. And for me, Opti Nutra went the extra mile by going top notch with everything in this stack. Product and packaging quality, brand name ingredients, testing and more testing, organic when they can. Right down to using and BioGenesis™ and Plantcaps®. Touches the average person wouldn’t even notice. Now that’s cool. [v] ”Rhodiola,” Life Extension Magazine. www.lifeextension.com. December 2007. Retrieved November 24, 2015. [vi] “Theanine,” Mitchell, Terri. Life Extension Magazine. www.lifeextension.com. January 2006. Retrieved November 24, 2015. [viii] “The “Other” Resveratrol,” Johnson, Tiesha D. RN, BSN. Life Extension Magazine. www.lifeextension.com/magazine. Retrieved November 24, 2015. [ix] “Vinpocetine,” Life Extension Magazine. www.lifeextension.com. February 2006. Retrieved November 24, 2015. [x] “Vitamin B6,” University of Maryland Medical Center. www.umm.edu. August 5, 2015. Retrieved November 26, 2015. David, thanks for your review! Even before reading your review, I had decided to try MindLabPro, for myself and for my 90 year old mother who has been showing some symptoms of cognitive decline (primarily short term memory) during the past 6 months or so. I hope it works well! I will also mention MindLabPro to her homeopathic M.D. next week. Thanks again! Thanks Bob. MindLab Pro is the best pre-made stack I’ve used so far. And I’ve tried a lot of them. Wishing you the best with your Mom. My primary doctor was impressed (to say the least) with NootropicsExpert.com. So thanks for visiting. And please share this with your friends too. Have you ever heard of Qualia? They also offer rather a complete pre-made stack, but there are a lot of ingredients. Could you maybe do a review in the future? I’m taking CILTEP, not very impressed. I can take MindLabPro, but what do I stack with if I wish to improve thinking, social, energy and motivation. Enrique, Mind Lab Pro will go a long way in helping you with thinking, social, energy and motivation. I’ve tried a lot of pre-made stacks. And Mind Lab Pro is the best ‘base’ stack by far. Please take a look at this post I put up in January 2017 on New Years Resolutions. In particular, go to this section > https://nootropicsexpert.com/7-nootropics-secrets-to-keep-your-2017-new-years-resolutions/#motivation. And scroll down through the other sections on memory, energy and anxiety. You’ll have plenty of options to choose from to stack with MLP. Notice in that post that the nootropics in green font with an asterisk (*) are already included in Mind Lab Pro. I’ve added Aniracetam, ALCAR, NALT, and Sulbutiamine to my MLP dose. And it works great for me. Good luck and let me know what you end up choosing that works best for you. will you give it to chidren? 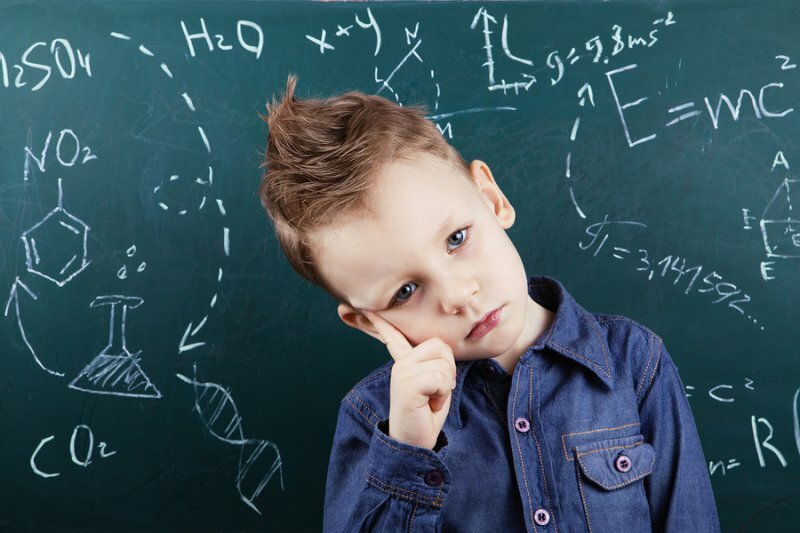 Marcel, I would give Mind Lab Pro to my child because there is nothing in this formula that would interrupt a child’s normal cognitive development in a detrimental way. I completely understand the company’s reluctance to advise you either way simply from a legal standpoint. They are correct in that nearly all clinical trials on most of the nootropics on Nootropics Expert are done with older people fighting some type of disease. All we can do is extrapolate the findings of these studies to determine if they would help a healthy person. I’m reluctant to advise you either way as well for legal reasons. Because I’m not a doctor. Don’t even play one on TV. But I would give one capsule a day to my child. I just started taking Mindlab Pro. Early days yet, but seems to be sharpening me up. I notice, however, that they’ve recently changed the formula. Vinpocetine has been replaced by vitamin B9, and pterostilbene with maritime pine bark. I’ve seen some conflicting opinions on pterostilbene, but I’ve read nothing but good things about vinpocetine. I guess time will tell whether vitamin B9 does the same job, but what’s your take on this? Are you still using MLP, and have you noticed a different effect following the formula change? Oscar, Vitamin B9 (folate) is ‘required’ for making dopamine, epinephrine, norepinephrine and serotonin in your brain. In my humble opinion this makes it a required ingredient in any pre-made nootropic stack. You need folate to work synergistically to make some of the other nootropics in the stack work. The other formula change to include Pine Bark Extract was a great decision as well. I love Vinpocetine. But it’s a prescription drug in some parts of the world. Which means Opti Nutra couldn’t ship Mind Lab Pro to those countries. And there is strong talk in the USA of taking Vinpocetine off the supplement market because of claims by a large pharmaceutical that they have first dibs on selling it as a drug. I’ve been using Mind Lab Pro daily for about 2 years. And I was just thinking this morning about how much better my memory is now compared to just a year ago. Thanks David. So do you think Vitamin B9 is doing the same job as Vinpocetine, or is it worth taking Vinpocetine alongside Mindlab? Gotcha. Thanks David. Look forward to your updated review. I want to switch My routine from ciltep + magtech from naturalstacks to mindlabpro, but i am worried about My energy level being low without the caffeine from smart caffeine, and I can’t use smartcaffeine with mindlabpro as the L-THEANINE dose will be doubled. Also do you think it is Good to continue with the magnesium boost from MagTech with mindlabpro? Joakim, I don’t see a problem using SmartCaffeine with Mind Lab Pro because that would only boost your L-Theanine dose to 300 mg. Maximum dose of L-Theanine is 1,200 mg per day according to the Cleveland Clinic. So unless you are especially sensitive to supplements 300 mg should not be an issue. And MagTech for your magnesium is a smart move as well. Your body and brain need the magnesium. i tried just yesterday 2 cap. of Mind Lab Pro and the results was amazing but, after the good effect i notice a strange situation: i feel the brain “overpowered” and for some hours i get stuck procrastinating for a bit and having brain fog and i feel the brain power but for 2 hours i can’t focus on what to do. After this “ritual” i finally starting think with a lot of focus, clarity and motivation. What’s your advice? Giulio, it sounds like 2 capsules of Mind Lab Pro started working right away in boosting neurotransmitters and neurotransmission. Once your brain adjusted, things settled and the stack continued to do its job. I think you have two options; 1. use only one capsule for a week or two until your brain gets accustomed to more nutrients. or 2. Use the dosing you’re using now and cope with the 2-hour lack of focus until your brain gets used to Mind Lab Pro. Which again, may take a week or two. I am two days into taking Mindlab pro at the standard dose of two in the morning. Not feeling much of anything except of course a side effect. What is in this formula that would cause a stomach ache several hours after the dose in the morning and even into the evening? James, Mind Lab Pro does not have any type of nootropic that provides a ‘stimulant-effect’. So you’ll not ‘feel’ anything noticeable like a big burst of energy, or amped-up alertness. Most immediate changes are subtle and take a lot of self-awareness to notice. Things like improved memory, better mood, less anxiety, etc. The most noticeable differences are after using the stack for 2 or 3 weeks. And looking back on what’s improved. For many, the improvements are profound but take awhile to realize. Bacopa Monnieri, Phosphatidylserine (PS), Rhodiola Rosea, N-Acetyl L-Tyrosine (NALT), Pine Bark Extract, Vitamin B6, Vitamin B9 (Folate) can all cause stomach upset in some people. So it’s difficult to pin-point exactly what the culprit is in your case. It’s unlikely the B-Vitamins are the cause because the doses are small. But it could be any one of the others. Have you tried taking Mind Lab Pro with a meal to see if that makes a difference? Or take one capsule with a meal in the morning. And the other at noon with a meal. Almost 3 weeks into taking MindLabPro, 5 days a week, off sat & sun. Only taking one capsule in morning, One at noon with food. Stomach upset was no problem splitting the dose, but the effect of drowsiness, dizziness, actual loss of clear thinking or short term memory has me baffled. I thought this formula would be to my benefit. I have yet to find one nootropic that works! I am extremely frustrated. My Mother has dementia, so I am afraid I will go the same route as her. James, that’s why we say “your mileage may vary” when it comes to nootropics. Or any dietary supplement. You’re the first person I’ve heard from who has reported a negative experience with Mind Lab Pro. Which is saying something for that stack. Fortunately, we have a ton of research on nootropic supplements for helping dementia and Alzheimer’s. My suggestion is do a search here on Nootropics Expert for “dementia” and another search for “Alzheimer’s”. And see what turns up. You’ll be surprised at your choices. It’ll take some research on your part and the willingness to experiment. Even on yourself first. And find something that works. It’s easier with individual supplements vs a pre-made stack because you’ll know almost immediately if something may cause a bad reaction. One thing to note is even though you are directly related, you won’t share ALL exactly the same genetic makeup. So something that doesn’t work well for one person may work well for the next. Even someone in the same blood line. Just keep that in mind please. David, I would like to order your book and am wondering if I will receive the hard copy as well as the digital. I am also needing to know if someone is on methadone is it safe to take these nootropics. Is there info regarding this in your book. Thanks for the wealth of information you provide. Laura, Head First is available as a digital download with a choice of .pdf, .mobi, or .epub depending on the reading device you prefer. 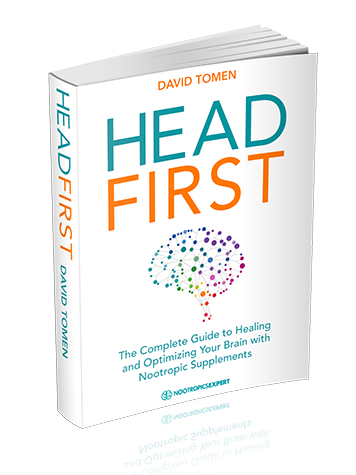 I’m hoping to release a hard copy of Head First as well. But it is taking awhile to put together the logistics. So for now it is digital only. Your question about Methadone and interactions with natural nootropic supplements is important. But there is no simple answer. 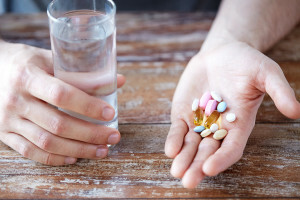 The best resource I’ve found so far for checking drug interactions is here: https://www.drugs.com/drug-interactions/methadone-index.html. One example I found doing a quick search is you should not use Ginkgo Biloba with Methadone: https://www.drugs.com/drug-interactions/ginkgo-biloba-with-methadone-1174-10621-1578-0.html. I’m sure there are several others as well. Most nootropics will be safe with Methadone. But some will not. So it’s important to check every supplement you are considering by using a resource like drugs.com before you take it. Safety is of course our highest priority here at Nootropics Expert. So my advice is get the book Head First and use the interactions list on drugs.com before trying anything. Hi! i Have been using mind lab pro for 2 and 1/2 weeks but i haven’t noticing any difference! now i know it takes time to see a difference but i have a question about the dosages! Its actually to little for each nootropic! so for instance, l theanine is 100 mg if i take it every day but don’t feel anything but in the long term will I see the benefits from it or must i take a higher dose? Mohinder, the dosages in Mind Lab Pro are high enough for a relatively healthy brain. The formula was designed so the nootropic supplements included in this stack work in synergy. To provide the kind of effect you would get if you were using much higher doses of individual nootropics. I find that I get the best results with Mind Lab Pro when I take it with a tablespoon of unrefined coconut oil, supplemental DHA, a B-Complex vitamin and magnesium. That stack would likely help anyone using MLP. Because most of us are low in Omega-3’s, the B-Vitamin, and magnesium. Coconut oil helps with better absorption of the fat-soluble nootropics in Mind Lab Pro. 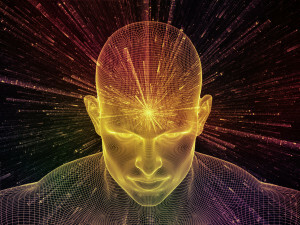 Everyone’s brain and body is different and will react differently to any nootropic stack. Including MLP. I find the changes are subtle. But have been getting more profound the longer I use it. Different forms of memory are better, I feel better, think faster, and am in a better mood. But I only notice these differences when I’m truly aware of what is going on with me and my environment. You can double your dose of MLP every day. Two capsules in the morning and two at noon. Roman, I plan to begin doing pre-formulated stack reviews sometime in the next couple of months. And Qualia is on my list to review. Thanks for the post I have been looking for something like this for a long time. I would say I consider myself very sound in terms of health (I am also vegetarian). However, I run 3 businesses and for a long time my only tool has been ultra marathons, Vitamin B and unhealthy doses of caffeine. I want to start using Mind Lab Pro but i notice it doesn’t have some of the nootropics in your 2018 list What are the essential add-ons to the Mind Lab Pro stack? Nsika, great question and thanks for asking. Mind Lab Pro is a great pre-made nootropic stack to use as a base. And for the “average” person who isn’t pursuing a high-octane lifestyle like you or I. But depending on what you are trying to achieve you may need other nootropics in addition to Mind Lab Pro. But I stress it depends on what you are working on to help cognition, memory and mood. In my case, I’m Adult ADD and require more dopamine and acetylcholine than what Mind Lab Pro offers. So I use the stack described in my ADHD post: https://nootropicsexpert.com/best-nootropics-for-adhd-add/. In your case I highly recommend making sure your B-Complex is all bioavailable. Using methylcobalamin and folate instead of cyanocobalamin and folic acid. Aniracetam is at the top of many a high-achievers list of nootropics. But it needs to be stacked with Alpha GPC or CDP-Choline to get the full benefit. DHA in a high quality Omega-3 is a must. As is a raw-food or whole-food multivitamin/mineral supplement. I’ve been using a multivitamin for years but didn’t realize until I wrote the last couple of posts how important this addition was for my body and brain. You are even more challenged as a vegetarian. Please use the search box top right for the keyword “vegetarian” and see what turns up. There are certain nutrients you are almost certainly lacking by following this diet. Learn what you are missing in your diet and how to fix it with the right nootropic supplements. Final word is using a high quality coconut or MCT oil 2 or 3 times per day. Your brain needs this fat and I cannot stress strongly enough what a difference this single thing can do for your cognitive health. I am taking MLP for 2 weeks and I do not feel anything different than before. Do you recommend to combine it with others nootropics, vitamins, supplements, etc? to enhance MLP. In this case, which supplements do you think can help enhance MLP? Thank you very much and congratulations for your blog, it is really helpful. Hugo, I do recommend using additional vitamins and minerals when using Mind Lab Pro. Most of us do not get sufficient nutrients from the food we eat every day. And our body and brain require these vitamins and minerals to make things like neurotransmitters. You could be low in any one of magnesium, iodine, selenium, any of the B-Vitamins, Vitamin A, etc. If only one or two of these critical nutrients are low there is no nootropic on earth that will help. On the other hand, if you are in perfect health and your body is getting everything it needs everyday it’s possible that Mind Lab Pro is not the right nootropic stack for you. Just received my first batch of Mind Lab Pro! 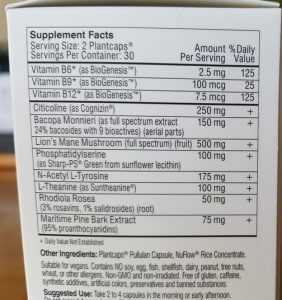 I was just wondering, should I stack this with a full B-vitamin complex or only with B1 given that vitamins B6/9/12 are already in the product? I’ve been taking a B Complex vitamin for some time but I don’t know if continued use of this would be ‘overdosing’ on B vitamins. Also plan to stack with fish oil and magnesium as per your recommendations…I may want to try additional nootropics that are meant to help with anxiety but I’ll see how I get on with MLP first! Colleen, the B-Vitamin dosages in Mind Lab Pro are low enough that you can safely use a quality B-Complex without overdoing it. I do and it works great for me. Just keep an eye on the total dosages. Hello, David. Thanks for the great review and all the great content on your website. My intention for M.L.P was to take it only on intense classes days, like the MBA classes I take on some weekends/month which last all day long (Sat. and Sun. ), and maybe some other days that I needed that extra push on brain performance. I do have brain fog and other brain issues that I´m already adressing with diet and some other things that are yet to be improved. However, I noticed Mind Lab Pro (M.L.P) is not the best choice when you want a sort of an instant push on brain performance, like you may would get by taking True Brain, for instance. I was actually deciding amongst those 2 premaid Nootropics, and ended up deciding for M.L.P. as it is all natural and concidering this will be my 1st time so I didn´t want to start with racetams (like in TrueBrain). That said, do you think I´ll benefit from M.L.P, like, if I take it next saturday/sunday which are classes days? Or it is only worth it if I take it continuously? If so, I´m considering taking like 3 days on/1 day off or so, because I always want to be extra cautious to avoid any sort of tolerance (although I do take a fair amount of caffeine thru black coffee every day). Thank you and sorry for the long question. Bernardo, many consider L-Theanine, caffeine, and ginseng as nootropics because they directly influence brain function. So you already have some experience with nootropics. To get the full benefit of Mind Lab Pro, you should be using it every day. Because while the benefits are immediate, the full effect of MLP comes from using it consistently. In a month or two you may find you will not need a “boost” on your heavy study days. But until then I suggest you use Mind Lab Pro every day. And something like TruBrain that contains the racetams on your heavy study days. I appreciate the fast response, David. As I don´t live in the US and it takes quite some time to have the products delivered to the country where I live in, I won´t be able to get the True Brain in time. Then in August I might try the True Brain as well. Bernardo, You should be able to safely add Alpha Brain to your daily stack on your two heavy days without overdoing it. Try it for a couple days and see how you feel. thanks for a really interesting and informative page, and the effort of helping people out! I am new to the world of nootropics but interested in how to get more out of my brain and myself. I have also trouble in concentrating and getting things done, mood swings, lack of energy, and low self esteem, which I would like to treat somehow. The spectrum of nootropics seems really wide and I am wondering, where to start. I was considering starting with Mind Lab Pro for three months and see how it works. Meaby later add something else, if it feels necessary. What do you think? I tried many different pre-formulated nootropic stacks in the last 12 years. But once I started using Mind Lab Pro I’m still with it. Because it works. And if I run out for a week I can feel it. Start with MLP and see how you feel in a month or two. Report back with your results and we can tweak it from there. Great review. What are your thoughts on taking Mind Lab Pro on an empty stomach? That is how I have been taking Mind Lab Pro for awhile, now; Primarily due to the fact that is it full of water soluble vitamins and amino acids. I see you take yours with Coconut Oil, is there a specific reason why, as opposed to an empty stomach? The other reason I use it on an empty stomach, is I stack the dose with 500mg of additional Tyrosine, and, I had tried Neurohacker’s Qualia Mind, and they mention to use it on an empty stomach – the ingredients are very similar. Hi David i bought your book and its awesome, i want to start using MindLabPro and im curious bcs to be honest i do use drugs like mdma/ecstasy/cocain like once or twice a year on music festivals. And i want to ask you if it can interfere with mindlabpro or is it save to use and if its not save then how many hours/days i have to stop taking mindlabpro before use of those substances and also how many hours/days to start taking mindlabpro after that night when ofcourse mindlab pro i ll take in the morning and other things at night. And i also wanted to ask if its problem to use performance lab sleep after that night because Performancelab sleep and also extasy/mdma interferes with serotonin. (If is something only precursor for neurotransmiters than it should be okay right? )Thank you for your answer. Marek, you are right to be cautious and I haven’t got a simple answer. Because it depends on what the drug is and it’s specific mechanism of action. I suggest looking up each ingredient for both Mind Lab Pro and Performance Lab Sleep. Learn their exact mechanism of action in your brain. And play close attention to the “side effects” section of each individual review here on Nootropics Expert. And do the same thing (Wikipedia) for the drugs you occasionally use. Understanding how each works will help you understand which may amplify or interact with another. I know for certain I’ve reviewed a couple of nootropics that work well when detoxing from something like MDMA. So please use the search function top right for “ecstasy” and “MDMA” and see what turns up. And thank you Marek for your feedback on my book Head First. It’s means a lot to me. And let’s others know that there is a real guide available now on nootropics and how to use them. I started taking Mind Lab Pro (MLP) and within an hour my mood was up, I was motivated and confidant and my productivity was up. This continued for 5 days. I then added Whole Food Multi (WFM), and crashed. I stopped taking WFM but didnt improve. I have retested MLP again and it made me feel worse, lower mood, anxious and couldn’t concentrate. I am wondering if it is the folate. I am hetrozygous MTHFR C677T, numerous COMT hetroxygous, and numerous MAOA homozygous and have reacted badly to folate in the past. But I thought MLP and WFM might have been ok for me as the B12 and folate in MLP and WFM are not the methylated form? I am ADHD and have been prescribed dexamphetamine, it works great for me, stops my racing mind, lifts my mood and confidence. But it only lasts 3 hours and I cant take it after 2pm, and have a terrible crash in the late afternoon. My doctors wont prescribe it for me anymore as they say I should not be taking it after age 50. I am desperate to find something to replace the dex. I have tried hundreds of supplements with no success. Do you know how dexamphetamine works in the brain and what I may be able to replace it with? Graeme, I had to think about this one and cannot give you a quick answer to what you experienced. The folate and B12 in the Performance Lab Multi is equivalent to the methylated form to ensure absorption. But I can’t imagine the doses are high enough to cause this type of reaction. Even with your MTHFR gene issues. As for dexamphetamine, you get a ‘terrible crash’ later in the afternoon because the stimulant forces your brain to use more dopamine. And especially in the aging brain, it runs out of dopamine much more quickly than it should. Younger guys have this problem as well. But it’s more pronounced the older you get. Come to think of it now, the use of Mind Lab Pro and the Whole Food Multi could have amplified how your brain is using the stimulant. Maybe the extra support I talk about in that post would help. I’m also taking Tricyclic antidepressant (TCA) Nortriptyline (Allegron). My biggest problem is social anxiety and depression. Because I’m taking antidepressant I don’t get depressed much, but social anxiety is the biggest problem for me. At the moment L-Theanine 400mg twice a day (800mg a day) works well for me, but I’m still uncomfortable in social situations. I would like to purchase Mind Lab Pro stack and see if it helps. In M.L.P. there are 6 nootropics that can help with depression and 7 that can help with anxiety, and one of them is L-Theanine 100mg. Would you please recommend how much L-Theanine I should add to M.L.P. stack? And should I still continue using L-Theanine twice a day as I do now, or once is enough? And could you please tell me if I need to add something to my basic stack like CDP-Choline or DHA or maybe some other vitamins? I’m not sure about Zinc, do you think I still should be using it? Sorry for so many questions, but you’re the only person that I know who can help me with nootropics. Mick, your L-Theanine dose is a little high but if it works for you then I wouldn’t be too concerned. Mind Lab Pro contains 100 mg L-Theanine so if you try it you many want to only take 400 mg L-Theanine once per day. Zinc usage varies with age. Older guys need more zinc. But any one dosing zinc should be using 1.5 – 2 mg copper per day. Increase your magnesium dose to 400 mg per day and take it in the evening. Also consider adding a high quality multi to your stack. My preferred multi is the Performance Lab Whole-Food Multi for men which works well for me. Mind Lab Pro also provides 250 mg Citicoline which may help. Definitely add 1,000 mg DHA per day. Once you start using Mind Lab Pro for a couple of weeks report back and let me know how you are doing. And we’ll go from there. We need to be careful because of your use of a tricyclic antidepressant. Thank you David for your recommendation, everything is clear. I will add Performance Lab Whole-Food Multi and DHA to my stack. I just have one question about Magnesium L-Threonate. The dosage rate on the label is 3 capsules equal 2 g (2.000mg) per day. At the moment I’m taking 2 capsules in the evening. You recommend to increase my dose to 400mg per day. What is the best way for me to do that? How many capsules do you think I should take? Mick, 2 grams per day is far more than what I suggested at 400 mg per day. I’d keep on doing what you’re doing. But in the evening. OK David Thank you. Once I’ll start using Mind Lab Pro for a couple of weeks I will report back to you and let you know how I’m doing. I have been suffering with depression and anxiety ever since I was 12. I’m now 32 and have been on nearly every ssri, snsri, nri, trycyclic and mood stabilizer known to modern medicine with very little and/or only short lived success and always with uncomfortable or even unbearable side effects. In January this year I decided to cut all the crap and go medication free! I could only hack this till just after my birthday in May when I (unfortunately- if only I had read this blog first!) Started taking 5htp, needless to say it didn’t work. I then tried vortioxetine (brintellix/trintellix) only lasted on it for 3 and a half weeks due to severe gastric upset. To top it all off, most of this year has been spent in and out of hospital with an array of debilitating symptoms which has culminated in a diagnosis of chronic fatigue syndrome/me and severe osteoarthritis in my cervical spine. I have spent the last few months researching the best way to end my life but despite my constant pain, anguish, brainfog and thorough torment I have come to the conclusion that I haven’t got the balls to do it and that somehow (f**k knows how) my body and/or brain wants me to live. Morphine sulphate (low dose) for pain. Zopiclone 2-3 times a week to try and get some sleep but again, i want to get off this as soon as possible. I will NEVER put another pharmaceutical antidepressant or mood stabiliser in my already fragile body and burnt out brain as they have all led to misery in the long run. And have long since cut all ties with the useless, harmfull and life wrecking mental health system. Interestingly, the only time I ever feel anything close to feeling happy is when ive taken all three medications together. With my limited pharmacological understanding I have identified that opioid related endorphins from the morphine and gaba stimulation from the ativan and zopiclone may be the reason I feel better at these times. I can briefly feel love and affection again for my family, friends and my dear little dogs and “normal feelings even close to happiness. I want to try mindlab pro partly for convenience and partly to take some of the guess work out of making my first stack. Do you think this stack is appropriate for me?or do I need to do something completely different? Also, if it is a good place to start, is there anything it’s missing that I should add (like sulbutiamine) for the specific relief my complex problems which im gonna simplify, in order of severity, here goes…..
Euan, I know how you feel because I was in that spot about 6 years ago. It took me nearly 3 years to finally get healthy again and I’m now functioning better than I ever have. So there is hope and I encourage you to keep experimenting with nootropics until you start feeling better every day. I do offer personal consultations as time permits if you are interested. Mr. Tomen, is there any other way to make an order besides using a credit card. I have tried 2 times with no avail. A month ago I started taking Mind Pro. Next week I have an important test. I take 60mg at one time – it works much better, but in the evening it’s over – I’m very tired. I have concentration problems and some anxieties. The pills help me and the situation has improved but the problems still exist and I still have trouble concentrating. All this I started taking two months ago. That does not help me. the opposite. Since then I have not been able to learn well. Next week I have a very important test. I wanted to ask, did – what I take, that much? What is their combined interaction? What is allowed to take together? What time of day? Is before food / after? What do you recommend for the day of the test? (The test from morning to night). Please review the following stack that was designed for those dealing with ADD or ADHD and are using stimulants > https://nootropicsexpert.com/best-nootropics-for-adhd-add/. Notice the last dosage late afternoon. That is used to prevent the stimulant crash you are currently experiencing. The only problem I have with Mind Lab Pro is that I can’t get an answer from them concerning the quality of their Lion’s Mane. I have asked what the mushroom is grown on, where it’s grown and the minimum percentage of glucans. Finally, I was told that their Lion’s Mane has a minimum of 25% Polysaccharides. But, that doesn’t necessarily speak to the quality of the mushroom. After asking for an update about a week later they told me they would have to forward my request to a colleague. I never heard back. So I sent another email a few days later and they said my questions have been sent to their “manager, who is currently out of the office”… I never heard back. 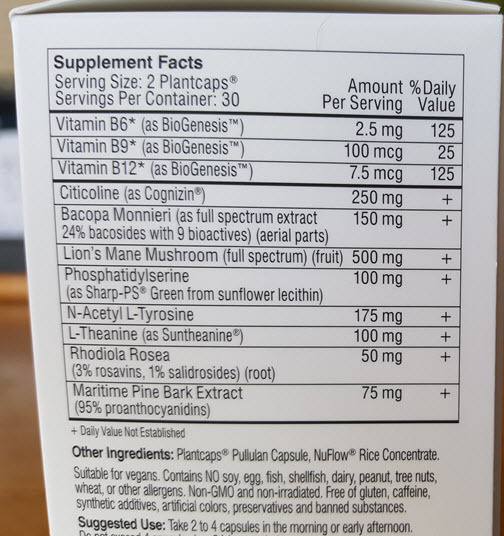 So it came time to reorder a couple weeks later and so I sent over another email asking if they have been able to get my questions answered and I simplified my questions to what is the beta-glucan content and what is the starch content of their Lion’s Mane mushroom. I was promptly told that my inquiry has already been forwarded to our R&D team but that they would send a follow up message to them. It’s now been a few more days and I have still not heard back from them. I will update this or send a follow-up reply if I ever hear back from them, but it seems I’m getting the serious run-around as to my questions concerning the quality of the Lion’s Mane in Mind Lab Pro. Having said all of that, the other ingredients within Mind Lab Pro are well defined and of high quality and still make this product worth the purchase price, but anyone taking this product expecting much from the Lion’s Mane should adjust your expectations until they make a statement concerning the starch content and the beta-glucan content of their Lion’s Mane. I would actually pay more if this is a high quality Lion’s Mane or if they switched to a proven high quality Lion’s Mane mushroom, but as presently stated, I have no idea if it is. I suggest contacting the Customer Service team at Mind Lab Pro again and asking specifically for a “Certificate of Analysis” for the Lion’s Mane they’ve used in the last batch of MLP. If you feel like you are getting the ‘run-around’ tell them David Tomen from Nootropics Expert specifically said to ask for the CofA. I know that these guys test and test their products before, during and after encapsulation. This information is available. But I also know that their business is growing like crazy because it’s a good product. And they’re doing their best to keep up in the Customer Service area. Including hiring more people. Let me know later this week if you’ve received what you are looking for by responding to this comment. I was on PL website for their Whole-Food Multi and discovered their other interesting formulas. One of them looks like a reduced version of Mind Lab Pro. Maritime Pine Bark Extract (standardised for min. 95% proanthocyanidins), 75mg (same). For a reduced price (about 20%), and considering taking it with their multi, what are your thoughts on that? Would you suggest me to try it, or to stick to the big brother? Andrea, you are correct in you evaluation. Performance Lab Mind was designed to be used with a multivitamin. In particular the B-Vitamins critical for neurotransmitter synthesis. My favorite is using Mind Lab Pro with the Performance Lab Multi. But you should have similar results using the combo you just discovered. Sushil, you can take Mind Lab Pro in the morning or early afternoon with or without food. I just wanted to take the opportunity to thank you for this outstanding site, as well as your video’s which are enormously helpful. I have been suffering extreme fatigue over the last couple of years, exacerbated by a separation early last year and becoming a single dad with little to no support from my ex partner. I was also suffering depression and was seeing a professional, who prescribed Duloxitine which is an SSNRI and that probably helped get me through the worst of the separation but it blunted me to the point where i almost stopped working. I’ve since come off that (very happily!). My fatigue got the point where i had to sleep in the afternoons and my work suffered causing my income to virtually stop. I’m self employed so that isn’t a great look – no fall back. I decided to try Modafinil and that’s been a godsend, but it’s not the wonder pill many bang on about, at least for me. That said, most days, it keeps me awake which is fantastic and an excellent starting point to getting back on track. I’ve since been looking at Nootropics, and I also happen to have some MLP which i tried a few years ago without any positive results, but I stopped them too quickly. I also take the odd Oxiracetam along with another Alpha GPC from time to time, but I don’t notice any change. So far, this stak appears to be working, i no longer have any brain fog, i can barely remember what it feels like to have it actually. My mind is much clearer and I have much more motivation in the mornings, but afternoons are still very difficult. So there’s an improvement, but not yet where i need/want it to be. I’ve ordered Noopept and SAM-e to test them out too. The SAM-e was based on your advice to help balance serotonin and dopamine as I am taking L Dopa and 5HTP. Is there anything you’d change in that stack? Also, which racetam might you choose as an alternate to Oxiracetam? I know this is a long email, I appreciate your time reading it! Dave, you’re definitely on the right track. The one thing that jumped out at my was you high dose of 5-HTP. I suggest re-visiting that one. Take a look at my sleep posts because you may be able to get the sleep you need by naturally boosting melatonin with something like tart cherry juice. Or Performance Lab Sleep. I’d also consider increasing your dopamine precursors. Either add NALT and/or increase your dosage of Mucuna. Noopept is a good option. I find that my productivity increases when using it. And I’d choose Aniracetam before Oxiracetam. Double or triple your Alpha GPC dose. And consider changing your dosage schedule so your taking some of these half in the morning and half at noon. And consider trying some NALT and ALCAR around 4 pm. Each time you dose should be with a high quality fat like unrefined coconut oil. OK thanks for such a quick reply! If I add NALT in the afternoon, along with ALCAR, given i already take L Dopa and I’m looking to increase that – would that be too much dopamine in the stack? Dave, it may be too much dopamine but the only way to find out is try it. Look up symptoms of excess dopamine so you can tell if you over did it. BTW, I do offer personal consultations as time permits. Please send me an email using the contact form (link in the footer) and I’ll get back to you. Message sent with email BTW..
Hi Again David, Further to my last message, I forgot to ask you whether you offer personal consults and if so, what do you charge for them? Maybe if you could email directly with details? Mood enhancement – I’m still suffering from depression, but it has improved a little. Anxiety – I Want less of it! It’s what i think is the main reason my work has suffered, I can’t bare the thought of picking up the phone most days. David: Opti-Nutra recommends cycling Mind lab Pro either 5 days on and 2 off or 4 weeks on and a week off. I notice you take it daily. Opti-Nutra claims the brain performs better using the cycling method. What say you? Dennis, cycling Mind Lab Pro may work better for some people. But that has not been my experience. I’ve been using it daily since late 2015 and it’s made a huge difference in my life. Everyone is wired different a sometimes looking for a different experience from using nootropics. I suggest you try using it daily for a month and the next month try cycling. And see if you notice any difference. I am taking Mind Lab Pro and have taken one pill for the past 4 days. I feel somewhat moody and edgy. Is this common? Have you ever heard of this happening? I was taking another form of liquid Lions Mane and also take a keto nootropic powder shake made by perfect Keto. I was planning on eliminating that once I saw how Mind Lab pro worked- I am focused and brain fog is gone but I do not like feeling edgy and snappy. Thoughts? Jeanee, edginess is likely caused by excess norepinephrine. Mind Lab Pro contains NALT which boosts dopamine which then converts to norepinephrine. It’s possible that you are extremely sensitive to increased dopamine. Or there is something in the ‘perfect Keto’ powder you are using that is also boosting dopamine or norepinephrine. Thank you for all the information you gave, it’s been very helpful. If I would like to stack Mindlabpro with Noopept and Aniracetam, what is the good starting dosage and best time to take it? Do you have any Discount Code to share for MLP? NE10 is not useable anymore. I’ll check into the discount code situation. First I’ve heard of it and was not told that it had expired. It’s the only one I have so I’ll check with Opti Nutra later today. I just wonder if I were to stack with MLP, should I reduce the dosage of the Noopept and Aniracetam? Ikmal, it depends on how you react to these supplements. I don’t reduce my dosage of Noopept or Aniracetam when using MLP. But that works for me. You may be different. I suggest experimenting with lower dosages and work your way up to find out. David,noted. I will start with half the normal dosage for 2 weeks and see how it affects me. Any reply from Opti Nutra regarding the “NE10”? Ikmal, I was just told my Opti Nutra that the coupon code is could until Feb. 15, 2019. So it should work. It if doesn’t I suggest contacting their Customer Support and find out why. Hi David, emailed the CS and it is all okay now. Now waiting my Noopept and Aniracetam and hopefully this stack work for me. My recent bloodwork indicated that I was not deficient in any B vitamins and actually had a high level of vitamin B6. Would it be harmful to take a supplement containing vitamin B6 or any other B vitamins for that matter. I struggle with severe social anxiety and I would like to take a formula like Mind Lab Pro but am concerned with the B vitamins. Annette, it’s good to be concerned but in this case, it’s not a problem. Because the form of vitamins in Mind Lab Pro are low enough and the right type that you don’t need to be concerned with overdoing it. Vitamin B6 as P-5-P is non-toxic and what your body recognizes instantly as B6. Synthetic B6 would be a problem. Have you seen my post on social anxiety? 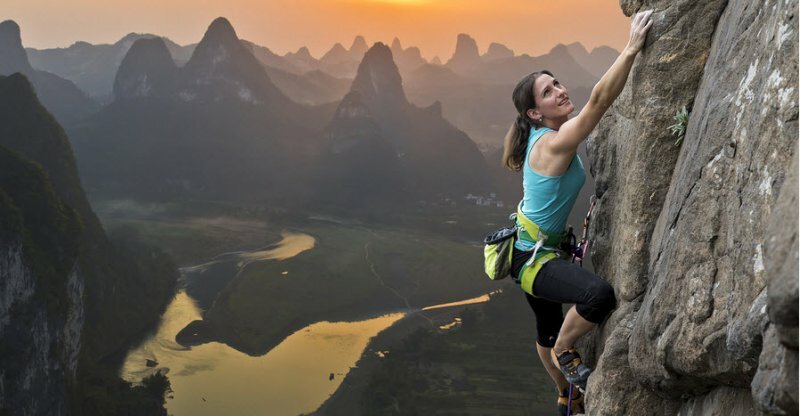 https://nootropicsexpert.com/best-nootropics-for-social-anxiety/. If you can figure out the root cause of your anxiety it would be easier to address. But if you are guessing then it’ll take some trial and error to find the right solution. You may want to start with something like Lemon Balm and/or Gotu Kola and see if that helps. Because they act more as adaptogens and hopefully could bring back some balance to your system. Hello David, I’m on Lexapro, can I use MLP with an ssri? Otto, it depends on how sensitive you are to meds and supplements. There is nothing in Mind Lab Pro that directly promotes serotonin. Which is what you need to be careful of with SSRIs and nootropics. Serotonin Syndrome is nothing to mess around with. A standard Mind Lab Pro dose is two capsules. So you may want to consider trying a single capsule first and see how you feel. I’ve been taking Mind lab pro (2 in the morning and 2 in the afternoon), Performance energy lab (2 morning and 2 afternoon), Alcar (600mg morning and 600mg afternoon), Nalt (600mg morning and 600mg afternoon) and alpha liopoic acid (600mg in the morning) I take this with MCT oil and either ritalin or concerta. Unfortunately I dont feel much of a difference. I still experience the stimulant crash and on my off days when I dont take my ADD meds, I dont feel the effects of the supplements. My motivation is still low, memory isn’t the greatest and still suffer from fatigue. I have read your posts on memory, fatigue and add however there’s so many different type of supplements you recommend and it’s quite confusing. Do you have any advice you could provide me with (changing my dosage, adding additional supplements to my stack etc) as exams are coming up and I really need to step up my game. Zey, this will take some experimenting on your part. I suggest dosing MLP, PL Energy, NALT, and ALCAR first thing in the morning and at noon. Then another dose of NALT and ALCAR later in the afternoon (i.e. 4 pm) should eliminate the stimulant crash. If you’ve read my story, you’ll know that I tried that stack for a year while not using Ritalin and it worked for me. But why do you have “off days” when you don’t use your meds? Another suggestion is replace NALT with standard L-Tyrosine. It works better for some people. And depending on your age, you many want to increase your NALT or L-Tyrosine dose to 750 or 800 mg. The aging brain loses 10% of its dopamine-making capacity each decade starting in your 20’s. And as you get older, monoamine oxidase increases which further depletes dopamine. Not sure what you mean by “feel the effects of the supplements” but assuming you just want relief from ADHD symptoms and not a feeling of euphoria, you need to find your sweet spot for dopamine and acetylcholine. BTW, if you are using Performance Lab Energy morning and noon, there’s no need to use additional alpha lipoic acid.